- Dimension: 4.72" x 5.31" x 5.71"
[Safe for Use]- FDA approved and accession Number: 1710661-000, the laser is under 5mW , Class IIIA is safe and will not hurt eyes when normal using. [Improved features] - Remote controller, Built-in 1 hr, 2 hrs, 4 hrs auto off timer, also it can stay on all night long. 3 brightness level adjustable (30% 60% 100%), Still or Rotation available. A great soothing projection night light for everyone. [2 Way Use & Amazing Aurora Light Show]- It is a little night light with dome cover on, a galaxy aurora projector when take off the cover. Project realistic aurora borealis and nebular light on ceiling or wall, create an enjoyable and relaxing bedtime experience for children, soothe and comfort kids to sleep, also perfect for adults to attain a relaxing and calming effect. [8 lighting projection modes & 45 degree titled adjustable]- red, blue, green and 3 colors allochroism, colors gradient, you can choose which color show depending on your mood. All colors combination shows you the Aurora relaxing magic world. Also in a different direction, convenient for you to cover a larger area. 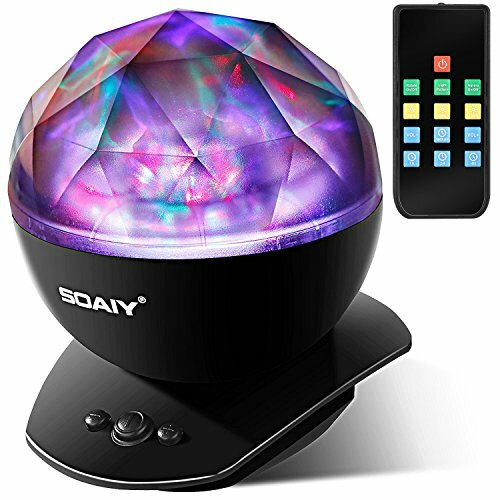 [Built-in speaker] - volume adjustable, you can plug in an ipod, iphone, MP3 or other device with the AUX cable in the package, and play lullaby music, relaxing, meditation music through the night light projector while watching the aurora at night. If you have any questions about this product by SOAIY, contact us by completing and submitting the form below. If you are looking for a specif part number, please include it with your message.